Wallingford Museum's latest exhibition is creating great interest with its 'Treasures with Tales' exhibition. Residents from Wallingford and the surrounding villages have loaned the museum a wide variety of fascinating objects, each with its own special significance - from exotic to fun to poignant! Visitors are able to follow the 'Treasures Trail' and discover these things for themselves throughout the museum. Each has its own 'tale' displayed and can be enjoyed by the whole family. The treasures are woven in amongst other exhibitions which include not only the story of Wallingford's Saxon origins, its great Royal castle, the town's links with Agatha Christie and Midsomer Murders, but also updates on the recent archaeology that is being uncovered by new developments around the town. CREATIVITY is a touring photographic exhibition, created and supported by The Photographic Angle.Historically we were always trying to capture the fleeting image, one that reflected reality as we saw it. By contrast, in a world of iPhones and Instagram we now often see images that present an altered sense of reality. Although photography is a creative art form in itself, the concept of this theme showcases the results achieved when camera settings, editing techniques and creative angles are used to the photographers advantage. All art is subjective and we fully expect visitors to be challenged by the work on display. Some images may be considered beautiful, while others are thought-provoking; some may even challenge your perception on what constitutes a photographic image. Free Public Admission. PATTERNS. They surround us. We come across them every day and yet we very rarely take that much notice of them. Exploring the hidden geometry that surrounds us, enables us to truly appreciate the way that pattern can help us to tell a story. Focusing on different forms, structures, textures and colours is a great starting point for exploring pattern and discovering the narrative that begins to unravel. The photographers who have work featured in this exhibition have taken nature, architecture, art, design and more as their inspiration. They have experimented with repetition, tessellation, symmetry, perspective, angles and magnification to create powerful images using visual patterns. PATTERNS is a touring photographic exhibition, created and supported by ThePhotographic Angle. Please check website prior to attendance for latest information as dates may be subject to change. 10am to 3pm - free entry. Immerse yourself in a morning of strategic learning, practical application and inspiration that you can take away and use immediately in your business or workplace. Creative, informative, & interactive, this half day event is packed full of fresh ideas to help you supercharge your sales and marketing! Windsor brings over 160 curated artists and galleries together in one place over one weekend to give you the best choices, so you can find exactly the artwork you are looking for and have a great time doing it. From established favourites, galleries, emerging stars and selected new talent, both national and European our artists work in a range of media from fine art to high-end photography, from glass sculpture to lino prints, textural abstract to traditional oil landscapes, meaning that art lovers can find that special piece that they want to take home! With a Private View evening there is a chance to appreciate fine art and fine wine with room to engage with other art enthusiasts a real social event in the calendar. Or drop in any time over the weekend to a fair full of great contemporary art , by living artists in an accessible venue outside London. There are live demonstrations by exhibiting artists where visitors can get an insight into how they create their individual style. There is an interactive art area with artist-led workshops to try your hand and discover your talent plus young visitors can show us just how much they know about art by taking part in the Art Quest. The Newbury Festive Market is a show with something for everybody and running alongside the British Pet Show it includes fantastic main rings, Celebrity Chef�s with amazing food and drink Producers, Rural Crafters, The British Pet Show, Festivals of Dogs, Eight bands playing daily, a festive living history area. You can enjoy browsing, sampling and buying in time for the upcoming Festive Season throughout this long weekend � with everything from Food & Drink, Arts, Crafts and Gifts together with Home and Lifestyle marquees as well as outside trade stands. All you need for Gift Shopping in one place. A Festive atmosphere offering a wide range of unique and exciting Gifts and Crafts. Father Christmas will be attending! The first featured concert of Reading Phoenix Choir's 50th anniversary season. This concert commemorates 100 years since the end of World War 1 and promises to be a very memorable and moving occasion. In aid of ABF, The Soldiers� Charity. Time: 7.30pm. THERE are a huge number of Armistice Centenary events planned for the Reading area tomorrow, Sunday November 11th. This is a guide to what is happening where and at what time� READING�S main Remembrance service will take place at Reading Minster starting at 9.25am. The service will be followed by a parade through the town centre, led by the Waterloo Band and Bugles of the 7 Rifles, to Forbury Gardens. The Remembrance Ceremony at the Forbury War Memorial will include the laying of wreaths and a two minute silence at 11am. TILEHURST: There will be a parade and service at the Triangle war memorial in the village from 10.15am. WOODLEY: Commemoration service from 10.30am at the Memorial Ground. A function afterwards at the Oakwood Centre will have poetry readings, music from the era and film documentaries. WOKINGHAM: A two minute silence will be held in Market Place at 11am. Also a parade will leave Wokingham Town Hall at 2.30pm to arrive at All Saints Church for a service at 3pm. BRACKNELL: The Royal British Legion parade will take place at 11.15am from The Lexicon. MAIDENHEAD: A civic service will take place from 11am at the war memorial outside the town hall and a service will be held in St Mary�s Borough Church afterwards. There will then be a march past in St Ives Road. WINDSOR: The High Street war memorial will host an act of remembrance and wreath laying from 11am, followed by a service at the parish church. The Windsor Boys� School band will provide musical entertainment from 6.30pm and the Last Post will be played at 6.55pm. The Mayor, Cllr Paul Lion, will light a beacon outside Cambridge Gate, on the Long Walk, at 7pm. NEWBURY: 10.25am:�Remembrance�Parade starting at Pelican Lane, marching the length of Northbrook Street, turning to Mansion House Street and to the Market Place. There will be a Remembrance�Service, then the parade will march to the war memorial before heading into St Nicolas� Church.�6.15pm to 7.45pm: Battle�s Over event, Market Place, Newbury. THATCHAM: 10.30am:�Members of the armed forces, the Royal British Legion, local dignitaries and youth groups will parade from The Kingsland Centre car park, round the Broadway and up the High Street, where they will gather in the war memorial car park. 6.45pm: St Mary�s churchyard for the lighting of the beacon at 7pm followed by the ringing of the church bells. This will be followed by a concert in the church.�COLD ASH: Noon to 5pm: Men of Cold Ash Memorials Exhibition at St Mark�s Church, Cold Ash. 3pm to 6pm: Men of Cold Ash Memorials � Commemorative Concern at St Mark�s. 7.15pm to 11pm: Hampstead Norreys Players presents Armistice Day � a play by Andy Green. PANGBOURNE: 6am National tribute � Lone Piper outside St James the Less Church. Battle�s O�er. 11.21am: Flyover from RAF Benson. 2.30pm:�Remembrance�Parade starting outside Pangbourne Police Station reaching St James the Less Church�for a Service of�Remembrance�at approximately�3pm, then walking back to finish at The George at approximately�4pm. THEALE: 10.10am: Holy Trinity church, Theale�Remembrance�Service followed by laying of wreaths at the war memorial at 11am. MORTIMER: 9.30am: Requiem for parishioners who gave their lives in the wars. The bells ring half-muffled in Honoured Remembrance�at St John�s Church. 11am: Act of�Remembrance�at the village war memorial and service to the memory of the fallen (Continues at St John�s Church). 6pm:�Remembrance�Service at St John�s Church. 6.35-7.05pm:�Remembrance�Day at the Fairground. 7pm: Lighting of WW1 Beacon of Light. BURGHFIELD: 10.30am:�Remembrance�Service and Parade at St Mary�s Church. BRADFIELD/BUCKLEBURY: 10.30am:�Service of�Remembrance�St Peter�s, Bradfield Southend. 10.55am: Service of�Remembrance�St Mary�s, Bucklebury. 10.55am:�Service of�Remembrance�St Denys�, Stanford Dingley. 3pm:�Remembrance�Sunday Service at the War Memorial, Bradfield Southend. TADLEY: 9.30am:�Remembrance�Service��for children and families�at St Paul�s Church, The Green, Tadley. 10.30am:�Remembrance�Service at Tadley Old Meeting URC (United Reformed Church). 10.50am:�Remembrance�Service at St Luke�s Church, Pamber Heath. 3pm:�Royal British Legion�Remembrance�Service will be at St Paul�s Church, Tadley. LITTLEWICK GREEN: A service will start at St John�s from 10.45am, and at 11am the priest, two British Legion flags and wreaths will be taken out of the church. Rev Tina Molyneux will read out the names of those local people who died. KNOWL HILL: A service will take place at St Peter�s from 10.45am and a beacon will be lit on top of Knowl Hill common at 7pm. TWYFORD: A united remembrance service will take place at St Mary�s Church in Station Road at 10.30am. WHITE WALTHAM: A service will take place at White Waltham Church at 10.45am. After the service the group will walk to the war memorial for a short act of remembrance. WALTHAM ST LAWRENCE: Waltham St Lawrence Parish Church is starting its service at 9.45am in the church yard where there are some war graves. A church service will follow and there will be a two minutes� silence at the war memorial at 11am. Former teacher Liz Tait began researching Reading's World War One casualties in 1996 when she discovered war graves in the old Reading Cemetery. Find out why these graves are there and the stories of those commemorated in what promises to be a fascinating and thought-provoking tour. The Farndale Avenue Townswomen's Guild Dramatic Society mounts yet another assault on the classics with a startlingly original production of Macbeth. What can go wrong does go wrong and results in a series of hilarious mistakes from beginning to end. 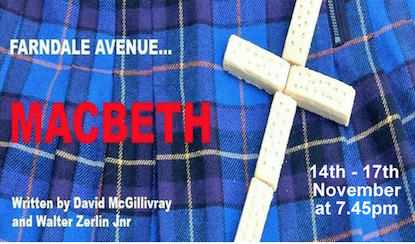 A play within a play with only a passing nod to Shakespeare�s masterpiece. For the fourth year the outdoor ski lodge bar will be back in Reading over the festive period. Gunter, head ski instructor/chief cocktail tester, and his team will be serving Mulled Wine, Frosty pints of Beer and their signature Winter Cocktails. Two years ago the bar moved to Station Hill, a move that WePop, the company behind the Apr�s Bar, were extremely excited about. Their excitement was well-founded! A huge attraction to the Apr�s Bar is their cosy mini chalets. Each one seats up to 10 people and is decorated with festive d�cor and blankets - and this year there�s a larger chalet as well, along with a marquee area with heaters. It�s a great spot to stop by for a swift drink during the festive period and it is also perfect for Christmas Parties. From reserving a small seated area or a chalet for a group, to hiring a section of the venue for your entire company. This established event will feature a wide range of stalls selling a host of handcrafted, artisan-made, unusual and exotic arts, crafts, clothing and jewellery alongside a great choice of food and drink. Market Square Group is delighted to be returning to Henley with this popular Christmas Market, offering shoppers, from both the local community and further afield, a wide choice of original Christmas gift ideas. As usual, we will be setting a high standard both in presentation and in the quality of products on offer for a discerning shopper.